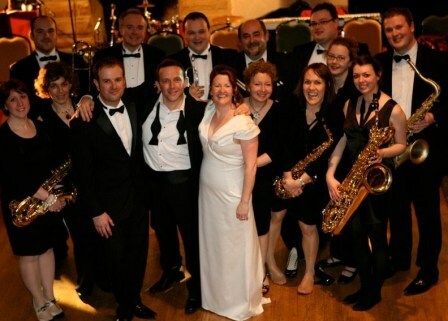 Mr Swing's Dance Orchestra is a 13-piece big band comprising male vocalist, four brass, five saxes and three rhythm. It was founded in 1997 with help from The Prince's Trust and has become very popular on the corporate, society and wedding circuit. Mr Swing performs classic songs from the radio broadcasts of the 30s. through the Glenn Miller sound of the 40s to the Rat-pack days of the 50s and beyond. Well-known songs made famous by Frank Sinatra, Dean Martin, Nar King Cole, Bobby Darin, Andy Williams, Tom Jones and Neil Diamond and more recently revived by Harry Connick Jr, Robbie Williams and Michael Bublé. The focal point of Mr Swing's Dance Orchestra is undoubtedly it's vocalist. Phil Chapman has had a love of big band music all his life - an affection very apparent in his performances. Mr Swing's Dance Orchestra has played to audiences the length and breadth of the country. All over Yorkshire, the North East, the North West, Leeds, Manchester, and London, Mr Swing's Dance Orchestra encourages young and old to get up and dance. With over a hundred songs on the playlist, there's guaranteed to be something for everyone. Mr Swing is very versatile. It can perform a mix of styles for a party audience, a ballroom dance or theme it's repertoire for a wartime event. As well as performing at countless weddings, Mr Swing's Dance Orchestra has entertained for BMW, The Air Crew Association, Leeds United FC, Elior and ITE Moda amongst others and was very proud to play at Buckingham Palace for The Prince's Trust Charter Award Ceremony. "Thank you and the band so much for providomh the music to out wedding last night. As I'm sure you'd expect, very many of our guests expressed their admiration of your performance. However, we'd heard you before and knew what to expect. Notwithstanding, your wedding swing band over-delivered on our expectations and we had an absolutley fantastic evening of music and dance thanks to you and your colleagues. We were genuinely delighted with you delivery and the way you made the party swing. Again, thank you, and we look forward to seeing you again at your public performances." "A huge thanks to you and the band in contrinuting to a very successful Battle of Britain Ball on Fridat 23rd September 2011. The music was varied, fun anf had the dance floor full from the start to finish. This is the 3rd time I have seen the swing band and each time there has been a different arrangement or new tune to add to each occassion. Looking forward to next year."